It always seemed like such a waste when great Spaghetti Western directors turned to making unmemorable, unfunny Western comedies. As such, it is a shame that Sergio Corbucci's last Western, The White, The Yellow, And The Black followed this mold. Boasting a great cast including Giuliano Gemma, Tomas Milian, and Eli Wallach as the leads, the film had great potential. The supporting cast is equally well chosen and consists of such memorable faces as those of character actors Dan van Husen and Romano Puppo. At it's core, The White, The Yellow, And The Black is essentially a spoof of the classic east meets west Euro-Western, Red Sun. This time however, the sword that is supposed to be delivered to the U.S. president in that movie is replaced with a prized Japanese pony. 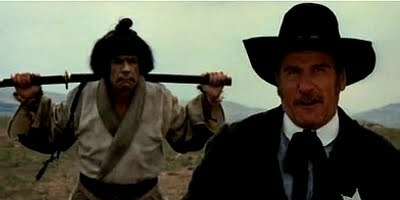 After the pony's samurai guardian is slain and the pony captured, a servant played by Tomas Milian assumes the role of samurai and teams up with Sheriff Black Jack Gideon, Eli Wallach, and an outlaw named Swiss, Giuliano Gemma, in order to retrieve the stolen pony and deliver the gold ransom for it. The three encounter trouble from Indians and renegade Confederate outlaws along the way all the while fighting amongst themselves. One aspect of the film that remains troublesome is the decision to cast otherwise superb actor Tomas Milian as a Japanese man, who is comically given the rather feminine name of Sakura meaning “cherry blossom”. Milian dons yellowface for the part and seemingly turns the role into one of the most stereotypical and racist portrayals of a Japanese character since Mickey Rooney in Breakfast At Tiffany's. All in all, The White, The Yellow, And The Black, despite some entertaining moments, stands as a rather weak entry in the Corbucci canon and ultimately feels like a missed opportunity given it's impressive cast.